Design clear and effective road signs easily with pre-drawn symbols. An advanced drawing program enables you to draw road sign extremely fast even when you start from scratch. Road signs are also known as traffic signs. They are displayed or posted in public places for easy view and function as a type of notice. These signs are used to name a location, show directions or offer instructions. With road signs or traffic symbol, people can make traffic directions as simple and seamless as possible. A group of colorful vector road signs are available for immediate use and print. The purpose of road signs is to send message clearly even in a long distance. Vector format can ensure high quality output which is quite important. 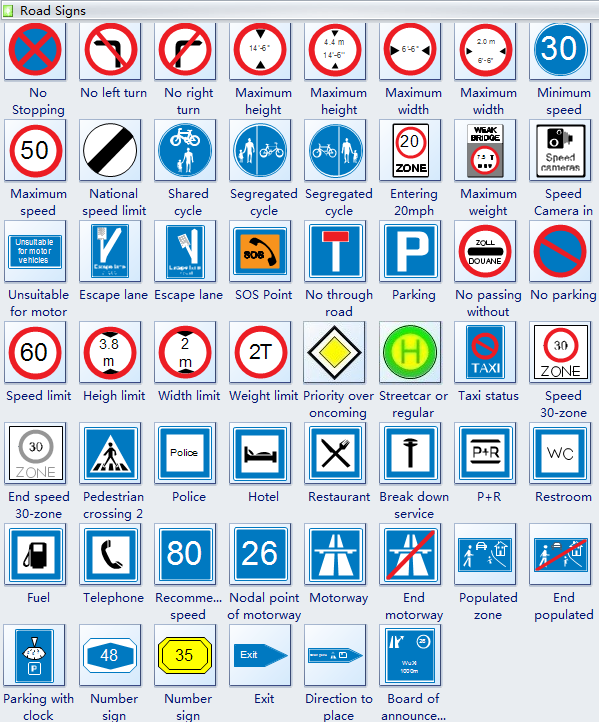 Just drag and drop ready-to-use road signs to the canvas and print in any size of paper. They are highly scalable and easily editable. You can also change color, size or the overall style. See how to customize these symbols according to your need in the next section. Our Traffic Symbol Signs put the options in your hands. Pick the signs that are right for your street with Traffic Symbol and Road Symbols from the inbuilt library. After starting Edraw, Click Maps in the Available Templates pane. Move the pointer to the right and double click Directional Map. Several libraries of symbols open on the left along with a blank canvas. 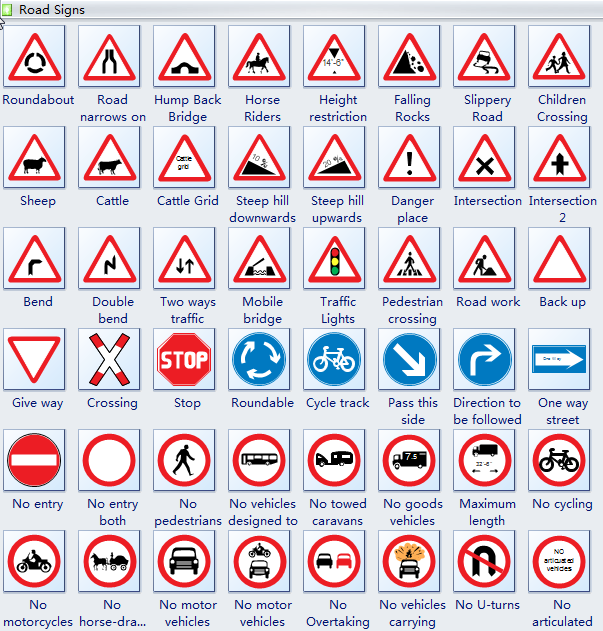 We need to use road sign, so click the library titled: Road Signs. Drag and drop the road signs you need to the canvas. And then you can use modify it instantly to suit your need. Select the shape to show the selection handles, green square points. Drag one of the selection handles outwards to enlarge the shape. Drag one inwards to decrease the shape size. Use the Fill tool in Style group under Home tab to change fill style. Note that when you click the first time on the shape, you select the whole shape. If you need to select a subshape, click on that subshape a few seconds after the first click. After the design is finished, save or print it. To print it, go back to File tab and click Print, select a paper size, specify how many copies you need and then click Print button. To emphasize numbers or other information, you can insert vector text.